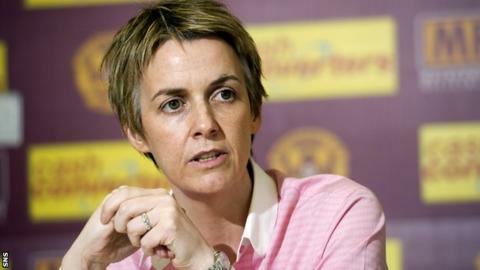 Hibernian have recruited chief executive Leeann Dempster from Scottish Premiership rivals Motherwell. Dempster, who was at Motherwell for more than five years, will take up her new role at Easter Road on 1 June. "We are delighted that Leeann is joining Hibernian," chairman Rod Petrie told his club's website. "Leeann is an outstanding football leader with a proven track record. I'm certain she will be a tremendously important 'signing'." Petrie stands down as interim chief executive on Dempster's appointment, but continues in his role as non-executive chairman. Dempster's remit is to "lead the club as it plans for success on the pitch and wider engagement with the Hibernian family". She is relishing her new role and hopes to create "a vision that everyone can buy into". "I believe that to succeed in a sustainable way in the long term we need to grow club resources, re-engage lapsed supporters and strengthen the club collectively," she added. "As a big city club, Hibernian has a fantastic opportunity to build on the great physical assets and grow attendances through increased engagement and success on the pitch. I'm looking forward to the challenge." Petrie said Dempster would "provide the daily leadership needed next season to help achieve the board's plans and meet the aspirations of supporters". Motherwell later issued a statement which revealed they would announce plans to fill the gap soon. Director Derek Weir said: "We are obviously sad to see Leeann leave and sincerely thank her for her efforts during her long period with the club. "The club were made aware of the discussions as they have developed and have worked closely with a view to our future plans, of which we will announce shortly."